Discussion in 'Replica Props' started by Star Wars Helmets, Mar 31, 2006. SDS seem to have been taking as bit of a slagging off here over recent days, and specifically the accuracy of the TIE helmet called into question. So yesterday I took some shots of my SDS TIE to compare it with shots I took of an original TIE I had access to a couple of years back. As far as I can see there are two clear Â“faultsÂ” on the helmet, the mohawk and the undercut "web", but in my opinion it is still by far the closest anyoneÂ’s come to replicating the original helmet. In addition its also worth noting that its made of the same materials as the original, and the composition/assembly of the helmet is practically identical. So I agree its not perfect and the mohawk is a nagging difference, but then IÂ’ve yet to see ANY helmet of any kind that matches an original 100%. However IÂ’d be genuinely interested to see if anyone can find a closer match. Here are the pics (Original left, SDS right)Â…. Note that if youÂ’re unable to post a civil response then please move on and donÂ’t bother posting. Sincere comment and frank criticism is welcomed, but IÂ’m sure no ones interested in this becoming yet another Anti-AA bash fest. Who owns the original TIE lid? I know it was spoken 'bout aways back when it was up for sale, but I've never really been interested in them... They be ugly (originals and fan-made), but saying that, I'd like to know more. There is no denying it is a very nice helmet. Only diferences I can see is the LHS of the faceplate (looking onto the faceplate) the SDS cheek tube looks a little thinner and the piece on the front of the mowahk is wrong. I am sure this will be classed as terrible by some. Anyway I like this helmet for what it is worth but I feel that opinions are so much set in stone about AA/SDS this will just have the same people picking at it for the sake of picking at it . Oh and just for the record I do own one of these and it hasn't fallen apart in any way shape or form. I think one or two people posted that the mohawk had come undone on theirs and it was like AA had put kittens into a bag and thrown them in a river :lol . Oh never noticed this bit. You are joking aren't you. Doesn't every AA/SDS thread start with this lets be civil, courteous to each other line then spiral into mayhem and cheap shots around about page 2. I liked the "kittens in the bag" quip too. Is it me or the SDS has green bubble lenses??? No seriously they do look green in some pics but theyre actually a smoke grey. Funnily enough this shot of an original makes the lens look green too. A few things I noticed right off were the additional greeblies that seem to have been "smoothed" over in the AA version, the nose above the teeth appears to be wider on the AA and the brow is higher on the AA. I assume the brow is what you are talking about with the undercut. This also leads to the visor portion of the helmet being high off the ears in the AA than in the original. Those were just my casual glance observations. Didn't DP make a deluxe version of the TIE helmet as well? I would like to see how those compare as well. The Imp cog doesn't match either. When I say the undercut I mean the base of the helmet - its noticable when you look at the side on pic. I agree on my TIE the brow does seem a little high, maybe 5mm - not sure about others though (or whether the originals varied like they did on the troopers), however I dont see any difference in the nose. Here's a pic of the DP Deluxe TIE, I'll get better ones next week. Its a nice helmet and came with the chest box and tubes and is made of solid fiberglass and looks quite sanitised/symmetrical. imo this is nowhere near as accurate - although a nice collectable. 765 - why's the decal wrong? The placement in the pics may be throwing you off. Since SDS had access to an original unused 1976 decal I'd be surprised if its out. There's something missing on your helmet, Jez. Yes it does match the difference is an optical illusion due to the glare making the white parts appear bigger and hazier on the SDS. See this thread and read on from post 46 and you will see it is the same. I kind of get the feeling that this cog myth (that appeared last week) as with a lot of SDS myths (TIE helmets all falling apart) will now stick as well even when clearly untrue. 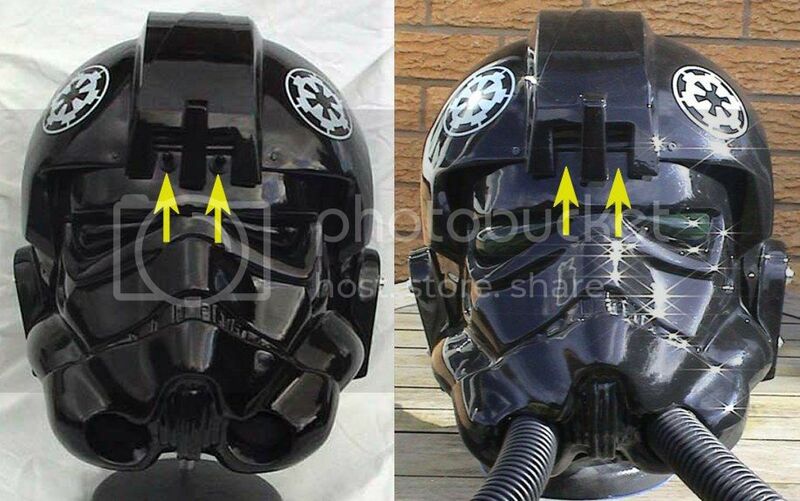 See starwarscollector's post one post ago both photos SDS helmets decals look different due to lighting and photography. I think that original Tie helmet with green lenses had replacement lenses fitted for ROTJ and the whole helmet was painted. The SDS helmet looks nice from many angles, but the bottom of the face hanging down like that is not a minor fault IMO, its a serious fault as it makes the face look really ugly. imo the "webbing" isnt a big issue but its okay to have differing views .I suppose it'd be great to have a helmet with all the best parts of the different helmets but unfortunately thats not possible. Would you mind taking some pics of your helmet from the same angles as above so some real comparisons can be done? Interesting point about the Original repainted rotj TIE. I can clarify that the SDS lenses are grey though. StarWarsCollector - oops, you're right. Ive got some new ones which need sticking on. Jez, i might be able to take some pics tomorrow if its not raining again. Jez's helmet is one of the very first helmets made which is why the lenses have a green tint, the greeblies are missing and the general assembly is off. The tube is the same but his ear is fitted too far forward. The production helmets have different lenses and a better fit. Albeit mine popped appart :rolleyes I had to request SDS move the decals closer to the edge as helmets before #35 are all located too far back. I have often thought about removing my faceplate and replacing it with a TE one and painting it black. RKW - youre right. I dont know if my helmet is indicative of the latter production ones (or whether there were any amendments over time). Note sure about the lenses though - they look grey. I dont think putting a TE face on would work. No disrespect to him but I have a TE TIE (and armor and chest box) and imo the face is not "right", its too narrow. The rest of it is superb though. Can other owners of the SDS Tie helmet post some close-up pics of the left side of the face then so we can see? I know TE may not be trading anymore but I saw a thread somwhere (sorry can't find it) that AP were quite willing to make a faceplate of black ABS. Maybe if you got in touch with those guys they could sort you out. Keith I will try to get pics of the LHS.